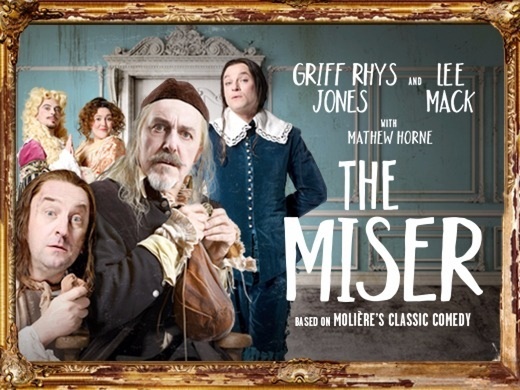 Starring two-time Olivier Award winner Griff Rhys Jones, Molière’s comic masterpiece The Miser arrives on London’s West End in 2017 in a brand-new adaptation by Sean Foley and Phil Porter. Griff Rhys Jones (Not the Nine O’Clock News, Three Men in a Boat, An Absolute Turkey) stars as Harpagon, a very wealthy and very paranoid man who will do whatever he can to protect his money. Desperate not to sacrifice a penny of his fortune even to his own offspring, he sets about trying to pair his children up with wealthy spouses. However, when real identities and feelings are laid bare will Harpagon prioritise his riches over his children’s happiness? Penned by France’s most celebrated playwright and first performed almost 350 years ago, this latest production of The Miser (L’Avare) is a major revival of the classic comedy. Directed by Sean Foley (The Painkiller, The Ladykillers, Jeeves and Wooster), Molière’s brilliant play is as ribald, as side-splittingly funny and as astute as ever, revealing an obsession bordering on madness and a message about our relationship with money that is as relevant now as it was hundreds of years ago. With tickets sure to be like gold dust, book your seats for The Miser at the Garrick Theatre today. No refunds after booking available after purchase. The full West End cast includes: Griff Rhys Jones, Lee Mack, Mathew Horne, Saikat Ahamed, Ryan Gage, Simon Holmes, Andi Osho, Michael Webber, Ellie White and Katy Wix. The producers of The Miser cannot guarantee the appearance of any particular artist, which is always subject to illness and holidays. We thoroughly enjoyed this play. I laughed right from the start. Excellent performances from the entire cast. a wonderful adaptation of Moliere's play the Miser. Very apt for the current political climate . Stage design imaginative and beautiful costumes. Joyous farce, great fun had by both cast and audience. The asides to the audience were pulled off with great timing. I had a grin on my face from the get-go! It was a perfect farce! Silly plot, silly voices and just a bit of fun. Gry Rhys Jones was suitably gruesome, odious but somehow still likeable. All the characters had charm especially The Miser's son and his true love Marianne. Lee Mack was perfect as the servant who performed all the roles in the house. There was a good amount of banter between the actors and the audience and i think that everyone left feeling cheerful. I do think Michael Billington must not really have a sense of humour not to have been more comimentary about this play. An excellent 'adult' pantomime!! Good humourous story and script. Just a few un-necessary blue jokes. Restoration comedy has to be shouted it seems but there are times when the shouting - especially from some cast members - means that the diction is lost. But definitely an enjoyable production. This was a funny play. it was entertaining and the acting was good. intentionally hammy for some of it. a lot of audience participation which sort of worked though i got the impression a lot of improvisation also involved. the use of specific voices (lisps etc) did actually make it difficult to understand quite a bit of what some actors were saying which was counter productive. but overall it was funny and worth seeing. Lee Mack was definitely pivotal in making this work. I have rarely enjoyed a play that much. This was one of the funniest and best plays I have seen in the past 20 years. The play is superbly directed and acted. The modernisation of the Moliere play to current affairs and modern politics were very intelligently achieved and perfectly in the spirit of the play considering that Moliere adapted it from Plautus, so why not adapt Moliere to our times? The interaction with the audience was brilliant. Griff Rhys Jones, Ryan Gage, Lee Mack and Mathew Horne are brilliant comedians and provided a magnificient cast. I can most highly recomend the play! Truly fantastic! Haven't laughed so much in years. Well acted fast paced and joyfully political. Thoroughly enjoyed The Miser. A wonderful mix of farce, pant and audience rapport made for great entertainment. Full of humour and great acting. This is a play with 'wanna go see.' written all over it - Superb. we loved it. Lots of interaction with the audience, energetic performances and fast paced delivery of some the lines. Very funny with some nice contemporary touches. Really enjoyed it. Griff Rhys Jones and Lee Mack adlibs were fantastic and made the rest of cast laugh. So funny. Would recommend. 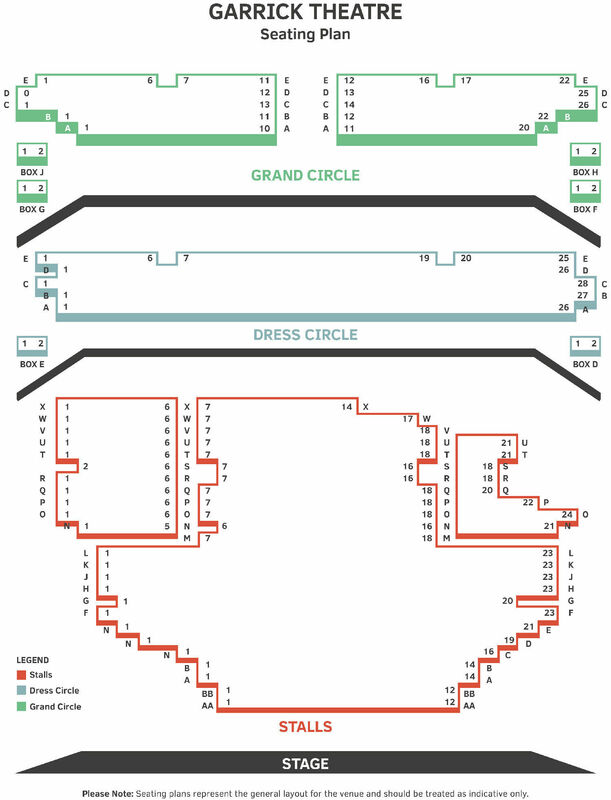 Get good seats if you're in the stalls. As the plot in this production of The Miser unravels in its closing scene, and as absurdities get disentangled with one totally implausible coincidence after another, one of actors turns to rhe audience. 'Who the hell wrote this stuff?' he cries. It's one of many moments in the production when the rules and conventions of theatre are joyously broken, and when actors and audience become united in a single community of observers and observed. Brecht called such moments Verfremdung, alienation. Another word would be bliss, the bliss of endless, unfathomable absurdity. Thank you, Garrick Theatre, for a most wonderful theatrical evening. We enjoyed every minute of it, very funny, all the cast were good but the two main stars Griff R.Jones and Lee Mack were brilliant, we especially liked the occasional adlibs that happened .Great show ! ! The only characters missing from this end of pier, panto farce are Widow Twanky and Coco the Clown. How the audience guffawed as Lee Mack effortlessly switched characters by swapping hats and gurning and rolled in the aisles when pieces of polystyrene furniture fell on Griff's head. I had both the restricted view and restricted enjoyment seat. Only go and see this if you need to dodge a passing shower -it's dire. Quite an entertaining show, especially the first half, but ran out of ideas after the interval and ending was a bit of a let down. Excellent. Well cast, and the topical references were in keeping with how the play would have been presented 300 years ago. What a joy, a good laugh,excellent acting especially Mr Jones not to be missed. Just Brilliant. Lee Mack and Gryff Rees Jones were superb. The cast are terrific, all working hard and all able to actually project their voices so the audience could hear the dialogue. All too often I have sat in the stalls thinking 'speak up! ', not last night, great visual gags, clearly spoken lines, camp humour, breaking the fourth wall constantly. A fun night out in the company of some experienced professionals. A top night at the theatre! Don't miss a chance to see this highly entertaining play (it's more like a farce). We beelly laughed our way through. Great performances by the cast. A real gem. Great fun- the story itself was nothing special but the actors warmed up and it turned into an absolute riot by the end! We thoroughly enjoyed the evening. The play was very funny and the actors certainly gave it their all. Thank you! I was laughing from the minute the curtains opened. Extremely funny, all the actors were great and the performance from Grif Rhys Jones was truely excellent. Well done Lee Mack for what I believe was your first role in Theatre, you were great, please do more. The cast were all on top form for this hilarious performance of The Miser. Playing to the audience and employing up to the minute gags, this farce kept its audience laughing throughout. Griff Rhys Jones and Lee Mack stole the show but were ably supported by all the cast with spot on comic timing, plenty of fun and silliness and a set where every little detail was part of the knockabout humour. Don't be put off by the luke warm review in the Daily Telegraph, this show is well worth the shekels! very good show with excellent cast. Loved the interaction with the audience. So good the title character reminded me of myself! This production might be entitles "Moliere Goes Wrong." Yes, it is slapstick, but delightfully so with a very talented cast. had no idea what to expect, but given the stellar cast had high hopes. was not disappointed, excellent performances throughout and enjoyed every minute. The Miser is a very funny and highly enjoyable production. Excellent cast and great fun to watch. Thoroughly enjoyed every minute, very funny and excellent audience engagement. The production was fun, slick, amusing, and gave Lee Mack a part in which he could pretty much be himself. The cast seemed to be having a good time and that pleasure was felt and shared by the audience, but be very careful about where you sit if not in prime seats - not because of audience participation but because in some cases only 15% of the stage can be seen! The three main characters were excellent. The three main supports were dreadful.. why they felt the need to ham up accents and lisps was beyond us. A shame.